In order to provide our patients with the best, personalized plans for their surgical procedures, we offer Vectra 3D imaging. Vectra is a state-of-the-art imaging system that can quickly take a scan of your breasts and sculpt your results to provide a realistic 3D image—all before making a single incision. Vectra helps our patients feel more comfortable when heading into their surgery by showing them what they have to look forward to. We use the Vectra system to take a quick and thorough 3-dimensional scan of your breasts. Dr. Burke uploads the scan into a specialized software program and you and Dr. Burke can review and alter the rendering using Vectra’s Breast Sculptor®. This can be done for both breast augmentation and breast lift patients. Using the Breast Sculptor, Dr. Burke can show you what the results of your breast enhancement may look like once you are fully healed. You can even see your potential results and how your new breasts may look in a bikini. The tool generates 3D renderings that demonstrate the possible results with implants of different sizes, projections, and shapes. With Vectra and Dr. Burke’s board-certified experience, you can rest easy knowing what to expect from your breast procedures. 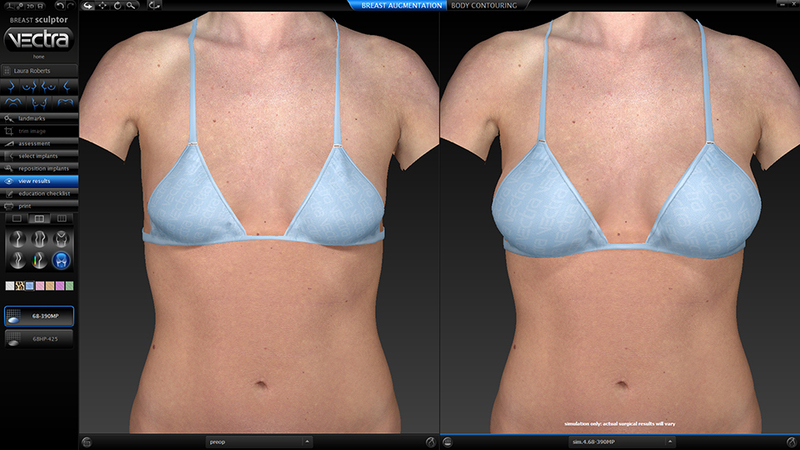 Ready for your own personalized plastic surgery consultation with Vectra 3D imaging? Give our office a call at (847) 382-4400 to schedule your one-on-one Vectra session with Dr. Renee Burke.